Perhaps no German prestige carmaker was more rattled than Porsche by the sudden appearance of electric-car startup Tesla Motors. With the sports-car brand having just launched its first sedan, the Panamera, the arrival of the Tesla Model S in 2012 offered an alternative take on a large luxury sedan: one offering stunning performance not from a huge V-8 but from electric power. Now we can see a first draft of how Porsche plans to fight back. The sleek, mid-size four-door Mission E sedan concept looks as much like an elongated 911 sports coupe as it does the hump-backed Panamera--and it's moved solely by a 600-horsepower battery-electric powertrain. Porsche will debut the car officially today at the Frankfurt Motor Show, but it displayed the Mission E last night at an event for invited press. It says it will decide by December whether to put it into production. 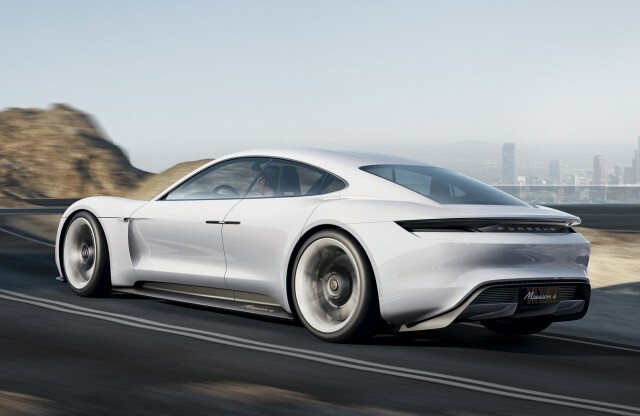 The concept is evidence that Porsche plans to offer a second sedan, one smaller than the Panamera--and has Tesla Motors [NSDQ:TSLA] directly in its sights as it does so. Powered by a battery pack of unspecified capacity, the Mission E uses two electric motors--one per axle--for an all-wheel-drive system that distributes torque to each wheel as necessary to maximize power delivery without wheel slip. 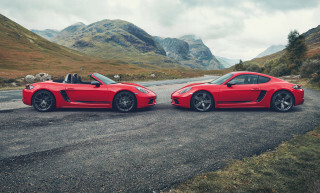 All-wheel steering adds to the torque vectoring for even sharper roadholding, and Porsche says it will do 0 to 62 mph in 3.5 seconds--and can lap the famed Nürburgring circuit in less than 8 minutes. Range is estimated at 310 miles, though that figure is likely based on the NEDC cycle used in Europe; a comparable EPA range for the U.S. would likely be around 20 or 25 percent lower. Porsche also claims the Mission E can be recharged to 80-percent capacity in just 15 minutes, using an 800-Volt charging system. Such a system doesn't exist today--even from Tesla--leaving open the question of how such fast recharging would be accomplished in real life. The body of the Mission E is a mix of steel, aluminum, and carbon-fiber reinforced plastic (CFRP), with rear-hinged "carriage doors" giving access to the rear seats without requiring a middle pillar. The battery pack--like that of a Tesla Model S--is located under the floorpan from axle to axle, side to side, giving it a very low center of gravity. 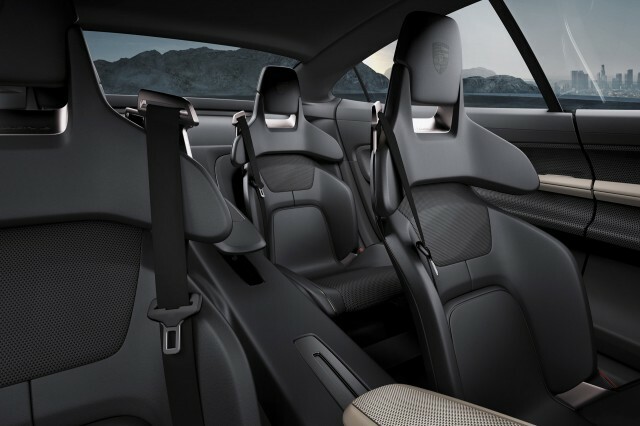 The Porsche concept has just four seats, but the lack of a driveshaft tunnel gives the interior a more open feel. A production version would be more likely to offer a three-passenger back seat. 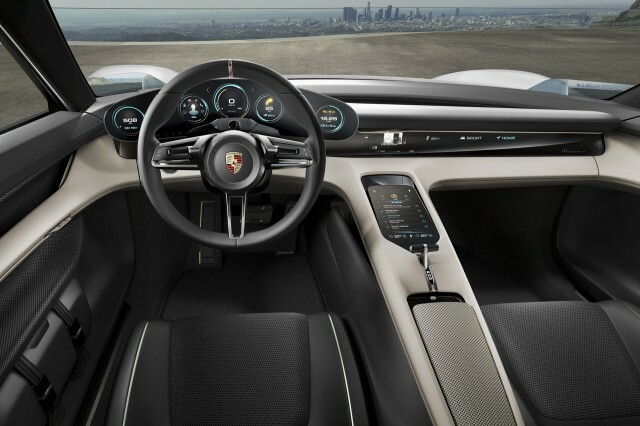 The Mission E's dashboard is the most futuristic part of the concept, with a holographic display extending to the front passenger area that portrays individual apps for climate control, navigation, or infotainment systems. These are stacked in "virtual space" and arranged in a three-dimensional array, allowing users not only to select each one but to control them using hand gestures. This "motion control" is detected by a collection of sensors that interpret each gesture: A grasping gesture means select, while pulling means alter the setting. More traditional drivers or passengers who prefer not to wave their hands in the air can control the same functions on a touchscreen display and get more detailed information in deeper menus. Like several concept cars before it, the Mission E dispenses with protruding door mirrors, replacing them with camera-based displays at the lower corners of the windshield. 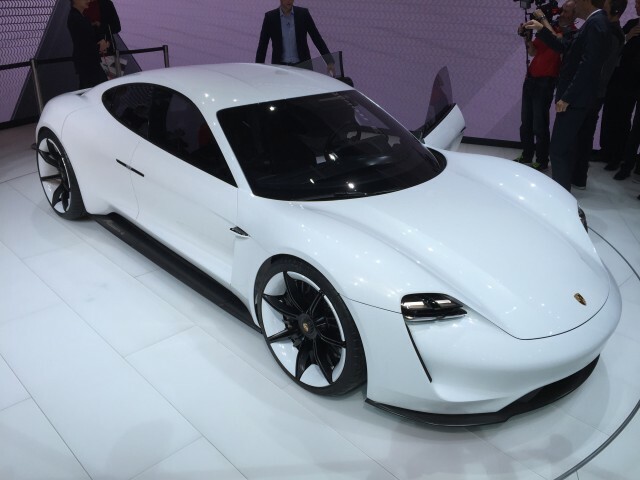 MORE: Porsche Electric Sport Sedan To Target Tesla In 2018, Fuel-Cell Version To Follow? The cameras themselves are mounted in the front fenders, producing far less aerodynamic drag than old-fashioned mirrors on doors--though Porsche will have to think through the effects of heavy rain and snow on the lenses. The displays can also superimpose safety information and other relevant data on the rear-view images.